I can remember the day like it was yesterday. The first time I felt someone’s unjustified hate towards me. I was 12 years old and away from home for a junior amatuer synchronized swimming competition. My 9 other teammates and I were in the locker room hallway having a “dry” swim through of our team routine — like we had done a thousand times before. All of us felt charged and excited because we would perform soon. We had worked so hard together to get here! The coach walked in for what I thought would be a pep talk to the team. Instead, she pulled me and my alternate aside and informed us my alternate would be swimming in my place. She gave absolutely no explanation. When I imagine this scene I can almost feel my head reel and see stars all over again. At the time I felt kicked in the stomach and like bleach was thrown into my eyes. There was no logical reason as to why this change would happen! My alternate was only supposed to swim in my place if something bad happened to me! Why me? Why was this happening to me? Why did my coach hate me? My coach was feeling angry and she directed her hate at me not because of me. But I didn’t know that for a very long time and until I did know, I felt terrible. I meet so many courageous people in my line of work as an English-speaking therapist in Stockholm. They’re motivated and determined to feel better. They feel confident that they can feel better. Even though it’s hard, they’re striving to make this happen. When I sit with them I listen to the different sides of them explain the unhappiness they’re feeling. Quite often I meet a part of them with very good intentions to help but their methods actually cause more pain. This part in its extreme form is a “hater.” It hates the part of the person feeling down and blue and wants it to go away. To understand this better, think of the movie Inside Out (if you need a refresher, read this post). 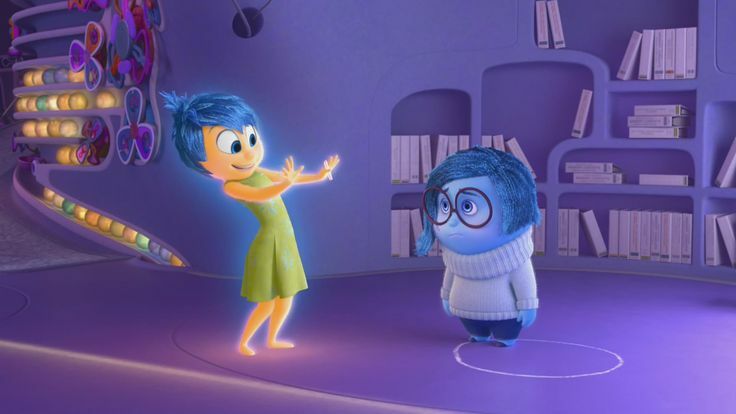 Joy really didn’t like Sadness. She felt that Sadness just ruined everything. If only she could keep Sadness in that little circle, so she would stop touching everything and making everything sad! Unfortunately, until Joy understood why Sadness was a good part, she ended up making Riley – and all of the other parts – even more miserable. Joy was a hater part. The only way to help Sadness and Joy was to stop the hate inside. The times when I feel badly I make a point to also wonder, “Is there also a part of me that doesn’t like how I feel? Is there a part that wishes that sadness would go away and not lead?” It would make sense if there was a part of me that didn’t like when I got sad because being happy is so much more fun. However, I can also be curious towards that part of me and hear what it is worried about. Maybe it’s worry is that I will stop exercising or hanging with friends or doing things that I usually like because of being sad. When we make connections with the different parts of us then as advisers they can mentor us into a better place not hate us into misery. We can stop the hate. Check inside. You probably have some mild version of this hater part that wishes the sadness would go away. One that believes life is better without it. And so on. If you check in with this “hater” part, it might tell you to just forget the sadness and do things that make you happy. All of what it says makes sense. And of course you can do that and cultivate activities and connections that bring about happiness too. But sometimes we have to look a little deeper. Could the part of you that hates the sadness and wants it to go away step back and let you meet your sadness and hear what is going on? Because that is what happens in my office. I am separate from all of the extreme parts inside my clients so it makes sense I can offer to listen to them sitting in Self energy: Calm, Compassion, and Curiosity to name a few Self qualities. When I do that I discover something inside of them that has been there all along. When you can listen calmly and compassionately to the sadness, it will begins to reveal its pain. When you stop the hate, the sad part can start to feel better. Does it sound risky to sit in your sadness? Maybe your sadness feels like a pond that will slowly swallow you up and drown you. If you sit down with sadness in your Self and compassionately listen with wondering, you will not drown. Ask your sadness, What is hurting? What happened. Often when I sit with my clients I discover with them a great loss which has filled them with grief. Their logical rational mind does not recognize this event as anything having to do with loss, missing, or grief. When the logical rational part along with the “hater”-of-sadness part step back and stop the hate, there is something nothing new to discover inside. You may be living with an extreme part inside of you hating another part of you because it can’t see its value. Hate hurts. It hurts on the outside and the inside. It can add to to sadness and bring in confusion. I had no idea why my coach hated me until I understood she was punishing me. A vindictive adult who should have known better. Unbeknownst to me at the time, the coach had been caught using the team funds for her private use. In fact, it was my mother who caught her, and as board president, my mother reported the coach to the board. The coach, however, remained for another year under scrutiny until she finally stepped down. I had asked “Why me?” but I found out it wasn’t even about me after all. Once I understood what was happening I started gradually to feel better. When you have parts of you that are acting in extreme ways it is time to get them back into balance. One way to do that is to bring some Calm into your life by rearranging some outside events. Add a large scoop of Compassion on top. Compassion towards yourself because it is so hard for you right now. Not pity but Compassion. Get started with Self Compassion here. Moonlight Synchro (White Night Melbourne 2014) by Flickr user Chris Phutully is licensed under CC BY 2.0. Share the post "How to Stop the Hate Inside"